A Plus Hostel is located in Prague's historical center, just ten minutes walking distance from Wenceslas Square and the Old Town Square. With its excellent location, you are close to all the major sights. We offer very affordable accommodation in the city center and a huge accommodation capacity. The hostel has been newly refurbished showers! Our low-cost hostel is close to the international bus station Florenc and Main train Station. 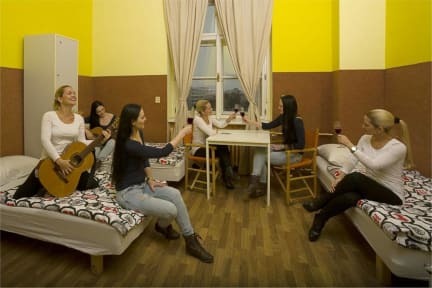 The hostel is among the largest in central Prague. People from all over the world meet here and enjoy our restaurant and our outdoor beer garden. We offer international cuisine and Traditional Czech food including Czech beer and Moravian wine. Every evening Sporting events are shown on our large projection screen TV, or you can play darts or table football in our clubroom which is open until 5 am. You can also use the internet for free 24 hours a day. We can organize excursions to the historic center, boat rides, horseback riding, paintball, paragliding and trips to the ZOO and botanical gardens. We have a 24-hour reception with check-out at 11 am. and check-in at 3 pm. We have free safes at reception to store valuables and documents. 1. and the 2. floor has a kitchenette for guests. The hostel is great and I definitely recommend it. I travel as couple as the double bed is great and clean. Having an elevator is awesome and the breakfast is also good. If you're travelling by car I would recommend planning looking for a parking spot beforehand, because the one right in front is expensive. Mal atendimento por parte da recepção. O cafe da manha não é gratis. As instalações necessitam de manutenção. A internet é muito ruim, não funcionava as vezes, toda hora caia.